The atmospherics of country are evocatively captured by Binyinyuwuy in Rain in the trees c1959, as he gives form to the seasonal rains that fall as the north wind blows, normally around November or December. In the lower section he portrays the patterns of lightning that are seen in the clouds. Finely painted and multicoloured, these reverberating bands give visual form to the dynamic forces that activate the landscape and enact the renewal and replenishment that is brought by the wet season each year. If read in planar view, they also provide an image of the subterranean effects wrought by this deluge. 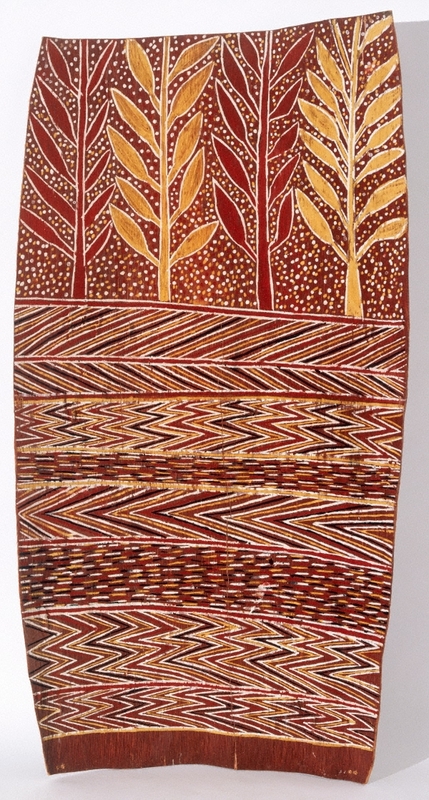 Ken Watson, Tradition today: Indigenous art in Australia , 'Binyinyuwuy', pg. 30, Sydney, 2004, 30 (colour illus.). Art from Milingimbi , Sydney, 2016, 52 (colour illus. ), 140.